The author was the great granddaughter of Jean Elisabeth Francois George Newman, son of Francis Newman and Lydia Sheridan. The author obviously knew a great deal about Francis’s life in the USA and something of the time that he spent in France with Lydia, but it seems probable that she knew little or nothing factual about their earlier lives in England. The story begins with the affair and elopement of Mrs. Neomi Fergusson with Lord John Elizabeth Cadebury, she being the young and beautiful wife of Captain Sir Laurence Fergusson R.N., and he a young, rich, handsome and debonair English aristocrat. The parallels between this couple and between Lydia Sheridan (née Fergusson) and Francis Newman (once of Cadbury Court) are obvious. The narrative begins as follows: Neomi is married to a lackluster naval captain with no private means. They engage in frivolous society of questionable morals in which Lydia does not feel comfortable. She meets and falls in love with the high-born, handsome and wealthy bachelor John Elizabeth Cadebury who throws aside his religious convictions to abscond with Neomi, first travelling incognito around England and thence to France, to the Manor House in Moulins of the Parisse St. Pierre, owned by the wealthy Cadebury. After several weeks in France, the couple’s raptures are disturbed when Neomi’s husband (suddenly desperately in love with her) tries to kidnap her, threatening to kill her if she resists. Cadebury arrives on the scene just in time to save her, Fergusson escaping back to England. However their happiness is disturbed by concerns that Fergusson will sue Cadebury for damages, since in those days adultery was a criminal offense and, if charged, the couple would be expected to appear in court to defend themselves and their reputations. Their concerns are further complicated when Neomi gives birth to a boy whose legitimacy is insecure. Neomi’s concerns prove short-lived however, because she expires shortly after giving birth. The story becomes ever more contrived. Cadebury’s sister Sara flies in like a fairy godmother to take charge of the baby and arranges for a second cousin (who has always been in love with Cadebury) to come to France in order to marry him and thus to give legitimacy to the baby. Cadebury, still being in love with Neomi, resists the proposal but plans instead to escape the darkening clouds portending the French Revolution by taking ship with his son, sister and cousin, to America. Oddly, the baby is christened before they depart, this being recorded with the following words “Before me, Vicar of St. Peter of Villefort, the son of the High Lord John Elizabeth Cadebury, knight baron and Lord Spart and Lord and Sovereign of Fullen and other lands and my lady Neomi Fergusson [who had presumably risen from the dead for the occasion], his wife of this Parish, was baptized. His Godfather was the Jacques Anthony, Marquis des Gouttes, chief of the Cadre of Mariners and Godmother was the High Lady Clare of the New Chasse, Abbyesse and Countess of Alix” (no name being recorded for the child). Marriage between John Elizabeth and his cousin Susan takes place on board the boat bound for Maryland where, almost immediately upon arrival, he purchases “a vast acreage surrounding a white columned house, The Grange, at Port Tobacco”. Quickly thereafter he becomes involved in the fringes of American politics with implied connections to some of the signatories of the US declaration of independence including a Charles Carroll who becomes a friend. Shortly, Cadebury hears about newly granted lands in the French colony of Louisiana. Cadebury sails south with two friends, Major William (or Enoch) Humphreys of Port Tobacco, Maryland (an Englishman who had once served in the R.N.) and Antonio Perez of Boston. Once arrived, the trio purchase 10,000 acres somewhere west of the Mississippi that become jointly owned by them. Cadebury’s share is bought in the name of his son who emerges with the name John Neomi. Inevitably but gradually, Cadebury falls in love with Susan and the couple have several more children including five (or six) sons and at least one daughter, his sister Sara remaining a spinster, but being the glue that holds the family together. She relates tales of England to the growing children, but this creates difficulties when the children grow older and begin asking about their English heritage and Francis’s English estates. Cadebury decides that they should know nothing about them and that they should focus their loyalties on the United States to which they belong. He promises to protect for them his “English rights by the right behaviour while I live and legally through my will when I die”, while his wife and sister promise to take “the secret” (presumably the secret of John Neomi’s illegitimacy) to their graves. John Neomi grows up and attends military college in Maryland, and joins the army as a lieutenant. In time he is promoted to the rank of captain and at the outbreak of the War of 1812 between Britain and the United States, he is placed in command of the fort at Petit Coquille just north of New Orleans. War brings challenges of loyalty for Cadebury who by now had several friends in the US cabinet, but more difficult is the challenge to his son who was to fight for his new country against his father’s old one. News comes that amongst the British invaders attacking the northeast coast is Rear Admiral Laurence Fergusson. Reports also arrive of wanton destruction of property as the invaders march southwards towards Washington and nearby Maryland. News then comes that the British, who have been fighting against Napoleon for some years, are planning to send troops to Louisiana which the US had purchased from Napoleon in 1803. Cadebury leaves his children in the care of his sister and, with his wife, sails southwards in the charge of a Captain Sewell. About half way down the coast, the ship stops to unload and load cargo while Cadebury, his wife and Sewell engage in a strange night-time excursion to a large mansion some way inland from the coast, owned by a group of French privateers associated with (or forming part of) the Baratarians, a local pirate group. After this, the story moves to New Orleans, becoming ever-more incomprehensible. Somehow the French privateers become involved with John Neomi in a plot against the British, causing difficulties for the government which had offered a reward for their capture. Cadebury becomes depressed at the realization that his wife no longer loves him and that he must sacrifice his and her children’s British inheritance by declaring his support for the Americans, having no other choice now that John Neomi is in uniform and ready to defend Fort Coquille against the invaders. Of interest is the description of the Frenchness of Louisiana’s inhabitants and their lack of American character and ideals, and therefore their suspect loyalty (which proves unfounded once the fighting starts). The British in their turn have urge the Spanish members of the population to revolt, freeing their slaves to join the fight against the Americans in order that Louisiana can be returned to Spanish control once the war is won. Cadebury himself becomes involved in supporting General Jackson in the defence of New Orleans. When the fighting starts, he participates in the action by helping sharpshooters to reload their weapons. He watches as the British general (Packenham) loses his horse and is assisted onto another by his aide, who happens to be (Admiral) Laurence Fergusson. Minutes later, both general and admiral are felled. Cadebury heroically dons a US military hat from a fallen US soldier and rides forward to help the wounded Fergusson, putting him on his horse to take him to safety behind the US lines. The sharpshooter who Cadbury had been assisting moments before, imagines that Cadebury is “giving aid and comfort to the enemy” and dispatches him with a bullet just as his horse carries Fergusson to safety. Shortly after, the British attack is repelled and questions are asked about the circumstances surrounding the Cadebury’s death which is put down to his “going berserk” perhaps in the delirious belief that he was rescuing his son. Nothing more is recorded about Fergusson or of John Neomi. The book, though short (just 88 pages), is not an easy read, having a weak plot, tortuous prose, problematic punctuation, and text that lacks coherence - often to the extent of incomprehensibility. 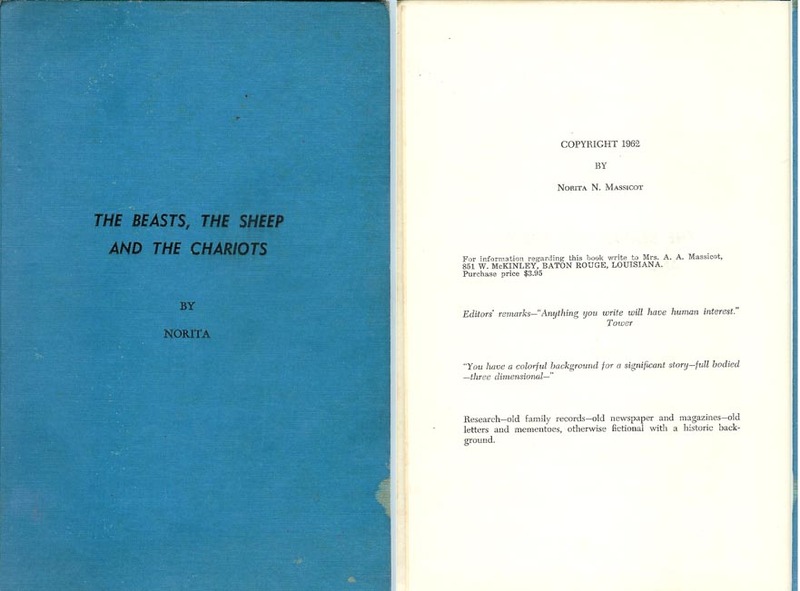 The title sets the standard in that regards since there is no obvious connection between beasts, sheep or chariots with the book’s contents. Whilst no dates appear in the text, many of the story’s setting are obviously inaccurate from a historic perspective. For instance: the story clearly begins around 1785 shortly before the French Revolution, yet it describes Cadbury and Neomi planning to meet in Trafalgar Square which was not completed until two or three decades after Nelson’s eponymous battle in 1805. Similarly, in describing the planning for British attack on Louisiana in March 1815, the Duke of Wellington is referred to as “the conqueror of Napoleon” when in fact Napoleon’s defeat at the Battle of Waterloo didn’t happen until some months later in that year. The story’s value, if it has any, is in the fact that the portrayal of Francis Newman’s life after leaving England, first with Lydia and later as an immigrant to America, appears to some extent be based on factual evidence. However without knowing what family records, newspapers, letters and mementoes were available to the author, one can only guess as to how much of the story is based on fact and how much is pure fiction. The handsome hero, Lord John Elizabeth Cadebury who begins the story as a bachelor, is obviously Francis Newman. The fact that Francis was not a bachelor when he met Lydia Sheridan which probably indicates that the author knew little about his prior life in England. Neomi Fergusson, the young and beautiful wife of Captain Sir Laurence Fergusson, is clearly Lydia Sheridan (née Ferguson). The writer probably did not know that Ferguson (or Fergusson) was her maiden name or that she was married to a British soldier who served in New York during the War of Independence. Neomi’s husband Laurence Fergusson is thus almost certainly a fictitious creation. Francis and Neomi’s son John Neomi is obviously Jean Elisabeth Francois George Newman, the illegitimate offspring of Francis and Lydia who was born in France shortly before the French Revolution. As in the story, he became a US army captain and was given charge of the fort at Petite Coquilles when the British attacked New Orleans in 1815. John Neomi’s baptismal record is obviously based on Jean Elisabeth Francois George Newman’s baptismal record in which Francis passed himself off as “High Lord FRANCIS NEWMAN, Knight,Baron and Lord Cadebury, Sparkford and Lord and Sovereign of Fullen, besides his other lands”. The author must have known of this baptismal record and probably believed that Francis was indeed Lord Newman which would explain why she gave the title to her fictional hero. The Manor House in Moulins, France, must be derived from the Château de Dorne near Nevers near Moulins where Francis and Lydia were living at the time of Jean Elisabeth Francois George Newman’s birth. It is highly unlikely that he owned it. Cadebury’s wife Susan must be semi-fictitious, but she is probably based on Francis’s American wife, Elizabeth Friers. One wonders if the author had some hint of the fact that Francis’s first wife was his first cousin when she cast Susan as his second cousin. Captain Sewell appears to be based on a Charles Sewell who must have been a close friend of Francis Newman since he, his wife, daughter(s) or sister(s) (Mary and Katherine) witnessed Francis’s signature to his will and its two codicils in 1817, shortly before his death. Charles Carroll appears to be based on a real character by that name who was a signatory to the 1776 Declaration of Independence. Perhaps he and Francis were indeed friends. Of interest is Cadebury’s sister Sara who travelled with Cadebury, Susan and the baby John Neomi from France to America shortly before the outbreak of revolutionary chaos in France. This might have been based on the hypothesis that Susan Bird Newman was Francis Newman's sister, since Francis describes her as his sister in his will. It seems however that she was in fact his sister-in-law, sister of Elizabeth Friers. The plot shines light on the society of the day where an extra-marital affair could result in criminal prosecution, and where illegitimate children could not only be ostracized but left without means or inheritance. This would certainly explain Francis’s and Lydia’s escape to France and her giving birth to her baby in that country, and their proclaiming themselves man and wife at their baby's christening. What seems very clear is that Francis arrived in America with funds in hand that were sufficient to purchase his La Grange estate in Maryland and later to invest in the Kenilworth plantation. According to Jerry Gandolfo, he also invested in the Oaklawn Plantation in Huntsville, Alabama, which is not alluded to in the book (and not discoverable on Google Maps either.) No doubt, US land was cheap in those days and his land purchases in the south were probably undeveloped, so these purchases may not indicate that he brought a large fortune with him from England. Interestingly, the book makes only passing reference to slaves in the South and no mention of slaves at Francis’s Port Tobacco estate. There is no reference to the slave trade either which was becoming a major political issue and source of conflict between Britain and America in advance of the War of 1812. The book does however mention a British plan to release slaves in and around New Orleans had they won the battle there, partly in the expectation of enlisting their support, and perhaps also as a result of Britain’s abolition laws that had come into force just a few years earlier in 1807.